Fibroblast growth factor-inducible-14 (Fn14), a receptor for tumor necrosis-like weak inducer of apoptosis, is expressed in the neurons of dorsal root ganglion (DRG). Its mRNA is increased in the injured DRG following peripheral nerve injury. Whether this increase contributes to neuropathic pain is unknown. 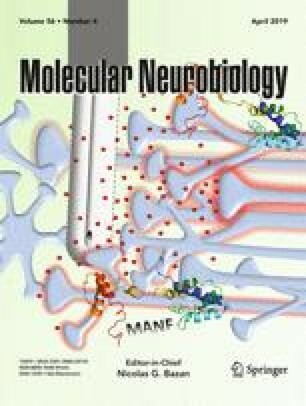 We reported here that peripheral nerve injury caused by spinal nerve ligation (SNL) increased the expression of Fn14 at both protein and mRNA levels in the injured DRG. Blocking this increase attenuated the development of SNL-induced mechanical, thermal, and cold pain hypersensitivities. Conversely, mimicking this increase produced the increases in the levels of phosphorylated extracellular signal-regulated kinase ½ and glial fibrillary acidic protein in ipsilateral dorsal horn and the enhanced responses to mechanical, thermal, and cold stimuli in the absence of SNL. Mechanistically, the increased Fn14 activated the NF-κB pathway through promoting the translocation of p65 into the nucleus of the injured DRG neurons. Our findings suggest that Fn14 may be a potential target for the therapeutic treatment of peripheral neuropathic pain. Li-Na Huang and Yun Zou contributed equally to this work. The online version of this article ( https://doi.org/10.1007/s12035-019-1545-y) contains supplementary material, which is available to authorized users. This work was supported by the grants (NS094664, NS094224, and DA033390) from the National Institutes of Health (Bethesda, Maryland, USA). The Institutional Animal Care and Use Committee at New Jersey Medical School, Rutgers approved all experimental procedures (IACUC approved number 13035A2E0716).